In a new report, C2ES emphasizes that states are taking the lead in developing policies to preserve existing nuclear power. Considering the urgency and nuclear plants’ role in helping us avoid carbon dioxide emissions, this is a welcome development. In order to meet mid-century climate goals, power sector emission reductions must include both substantial growth in renewables as well as maintaining zero-emission nuclear generation. New Jersey is a case in point. With sizable majorities, the legislature recently passed three environmental bills which now await the governor’s signature. Taken together they represent one of the most significant commitments to zero-carbon power in the country. The first bill would establish a zero-emission certificate (ZEC) for zero-carbon electricity generation from New Jersey’s existing nuclear power plants. That credit links fiscal benefits to environmental priorities to reduce greenhouse gas emissions, similar to those used to support solar and wind energy. The ZEC incentivizes the environmental and fuel diversity benefits of New Jersey’s existing nuclear plants, which provide 40 percent of the state’s electricity. Public Service Enterprise Group (PSEG), the plants’ owner, would be required to open up its books to the state Board of Public Utilities, which determines the amount of credits the plant can, or should, receive. Additionally, there are cost containment measures in place to ensure consumer affordability, and ZEC payments would be reduced or eliminated if sufficient regional or national solutions are implemented. The second bill would significantly expand New Jersey’s renewable portfolio standard by requiring utilities to procure 35 percent of their electricity from class 1 renewables (i.e., solar and wind) by 2025 and 50 percent by 2030. Additionally, it would boost the state’s offshore wind goal to 3,500 MW, set an energy storage target of 2,000 MW by 2030, create a community solar pilot program, and require substantial utility energy efficiency gains. The third bill would create a pilot offshore wind project – four six MW turbines to be built in federal waters off the south Jersey coast. The suite of bills, when combined, comprise a critical step toward helping the United States achieve its long-term climate goal of reducing our greenhouse gas emissions by 80 percent or more by 2050. With its existing nuclear plants and its strong commitment to renewable energy, New Jersey will have in place all the elements to achieve up to 90 percent zero-emission electricity by 2030. This deep decarbonization of the electric power sector is an essential element of and companion to support increasing electrification in transportation and buildings. As is so often the case with environmental policies, states are proving to be effective testing grounds. 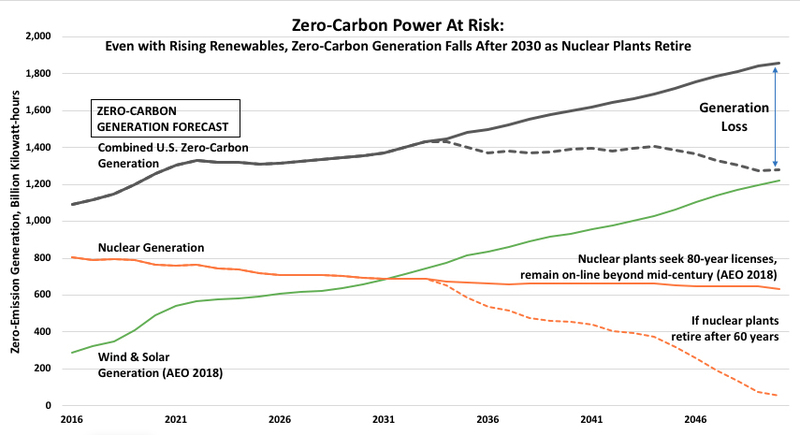 In addition to steps being taken in New Jersey, policymakers in New York, Illinois, and Arizona have enacted or put forth proposals to promote zero-carbon nuclear generation. Analysis from C2ES shows that we need existing nuclear and ambitious renewable deployments to work together, in order to continue to increase the domestic share of zero-emission generation without the potential of backsliding. Across the United States, zero-carbon nuclear generation is uncertain. Five nuclear power plants have closed since 2012, and nine more are scheduled to close by 2025 – a total of 16,000 MW of zero-emission generation will be retired before their licenses expire or about 15 percent of the total installed nuclear capacity. To give a sense of what a big deal that is, the quantity of generation that would have been provided by those 14 plants is roughly equal to the generation that will be provided by all of the solar PV currently installed in the United States. To make matters worse, there are reports that up to half the U.S. nuclear fleet is operating at a financial loss, which makes it likely that additional plants will close prematurely without state or federal action to support the role of nuclear energy in zero-carbon power generation. The potential for further closures is greatly concerning because the C2ES review shows that these plants are primarily being replaced by fossil fuel-fired generation. Since the carbon intensity of the electricity grid varies, emission increases from a retiring 1,000 MW plant can range from 2 to more than 5 million metric tons of carbon dioxide annually, depending on where the retirement occurs. Early retirements are primarily the result of a market failure. Wholesale power markets, a key source of revenue for nuclear plant owners, are not explicitly rewarding the environmental attributes of zero-emitting power sources. Therefore, compensating zero-emitting power for its environmental benefit is justifiable. The ZEC was explicitly created to compensate a nuclear power plant for each zero-emitting megawatt-hour it produces. New York and Illinois approved ZEC programs in 2016, and their programs have already withstood early legal challenges. Actions underway to preserve existing nuclear plants for as long as practical are justified considering the amount of carbon dioxide reductions that are necessary by mid-century. New Jersey is almost to the finish line with the three bills it recently passed, which are merely awaiting the governor’s signature. Other states should take a cue from New Jersey and pursue proactive policies to bring zero-emitting nuclear and renewables together to help get out ahead of this issue and avoid the worst effects of climate change.